Menu bar for opening stored pages and managing windows and tabs. Navigation bar for entering a URL and for moving backward and forward in the web page browsing history. Multi-tab area for displaying web content within tabs. Status bar for displaying hovered links. The web content can be opened in new tabs or separate windows. HTTP and proxy authentication can be used for accessing web pages. Browser is a singleton class managing the application windows. 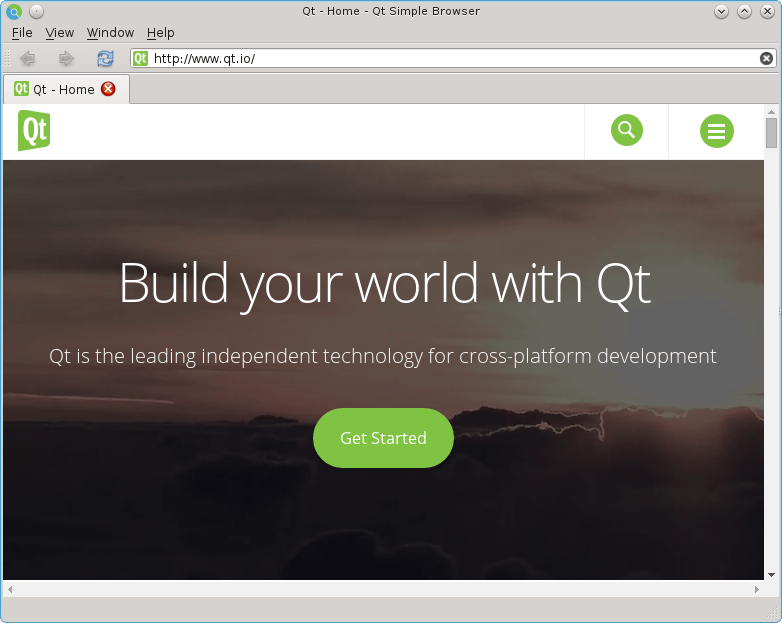 BrowserWindow is a QMainWindow showing the menu, a navigation bar, TabWidget, and a status bar. TabWidget is a QTabWidget and contains one or multiple browser tabs. WebView is a QWebEngineView, provides a view for WebPage, and is added as a tab in TabWidget. WebPage is a QWebEnginePage that represents website content. This example supports multiple main windows that are owned by a Browser singleton object. This class could also be used for further functionality, such as downloading files, bookmarks, and history managers. tr("Render process exited with code: %1\n"
We add menu items to the context menu, so that users can right-click a link to have it opened in the same tab, a new window, or a new tab. We override QWebEngineView::contextMenuEvent and use QWebEnginePage::createStandardContextMenu to create a default QMenu with a default list of QWebEnginePage::WebAction actions. As mentioned earlier, each WebView contains a WebPage instance that was created by using QWebEngineProfile::defaultProfile(). The handleProxyAuthenticationRequired signal handler implements the very same steps for the authentication of HTTP proxies. In case of SSL errors, we just need to return a boolean value indicating whether the certificate should be ignored. The setUrl() method of WebView just forwards the url to the associated WebPage, which in turn starts the downloading of the page's content in the background.